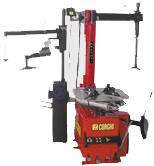 CEMB's Tire Changer's are the top of the line professional which aids in changing the most difficult to change tires, such as extra low profiles and run flats. CEMB wheel automotive equipment for medium to large size garages, car dealers, tire shops or any business wanting to be able balance all aluminum wheels with precision, speed and accuracy. CEMB's total vehicle wheel alignment machine reduces wear, improves safety, reduces fuel consumption and driver comfort. Comes fully assembled Zero Tolerance Wheel Balances Start with Corghi. Technology, reliability, ergonomics and design combined in superior quality products to accommodate all wheel specialists' needs. AM26 Artiglio Master makes changing run-flat and ultra-high performance tires as simple as 1, 2, 3. The Artiglio Master eliminates the lever, physical effort, and the precaution and worry about damaging expensive wheels and tires.